With this on the cover: "An outrageously funny and wickedly raunchy romp in the woods," how could I NOT crack the book open? Dan vs. Nature delivers. 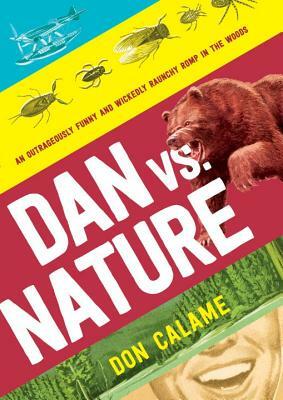 Author Don Calame caught me from the first line and kept me beside Dan the entire way. I was laughing out loud through the 375 pages. Seriously. Dan sets out on a wilderness adventure with his future stepfather and his best friend. The mission, apart from survival, is for the teens to stop Dan's mother's upcoming marriage. Matters are complicated by Dan's assignment to care for the Life Skills class baby doll along the journey and the addition of a geektastic hot girl being added to the group. From bears to bugs to lightning storms, the group is tested and tried. The male author carefully unwraps the emotional journey of one boy recovering from abandonment by his father, hit by hilarious physical trials, amidst a group of hard-earned friendships. I zipped through this work, rgz, laughing and thinking of who to loan it to next. Find it. Laugh. And look for more by Calame. Well done! Rock the Drop, October 14, 2016!